The next morning I flew to Kisumu. The director of the orphanage met me at the airport and drove me to his home, where I stayed with him and his family for the next several days. Other than camping, I had never been without running water and electricity for any length of time, but I thought it sounded like fun for a few days. And it was fun. The people I met were absolutely anxious for nothing. When I asked them why they seemed so content, they told me they believed that if God wanted them to have something more than what they already had, they would have it. If they didn’t have it, it was because God knew they didn’t need it, at least not now. I didn’t hear one word of complaint—not one—even though there were reasons to complain on more than one occasion. 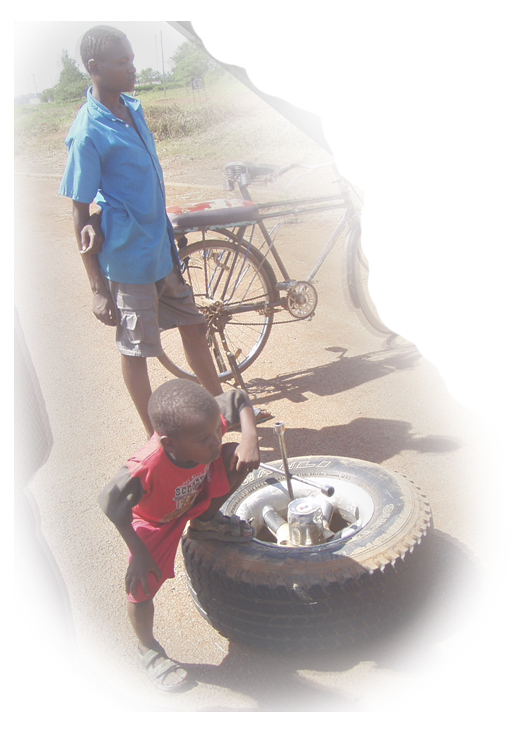 One occasion to complain was when the rear brakes locked up on the SUV on our way back to Kisumu to pick up some supplies. The town was about 55 miles away. The solution? Drain the brake fluid…all of the brake fluid. It made sense, in a way, because without brake fluid there was no way the brakes could possibly lock up. Of course, that also meant we would not have brakes for the rest of the journey, but never mind that. Keep in mind we had to travel several miles, down hills and around curves that tended to be scattered with people walking and riding bikes, and with little kids herding their cattle alongside the road. And I already mentioned the tanker trucks that flew up and down the roads with what appeared to be a reckless speed. I asked if anyone ever got hit walking along the road. I was told it happened only on rare occasions. The reason: “People learn by experience to be alert.” So here we are, heading toward Kisumu with no brakes whatsoever. It was kind of like the rush of a wild Disney ride, without the assurance the ride would end well. No one else in the vehicle seemed concerned, so I settled in for the ride. Nevertheless, I couldn’t help but notice how alert I was. I had been told I would be asked to preach while I was there, so I had prepared a couple of messages. My first opportunity came the morning after I arrived, which was a Sunday. The service started with a very lively time of musical worship, followed by a lady pastor who preached from her heart of passion for about an hour or so. Then it was my turn. My interpreter was doing a fine job (as far as I could tell) translating everything I said into Swahili. I was amazed at how he used the same tone and vocal inflections I used. I confess, a couple of times I threw in a little something extra just to see if he would get it. He didn’t miss a beat. When I finished and sat back down, one of the leaders whispered to me that I wasn’t finished yet. I assured him that I was finished. He explained to me in hushed tones that many of the people had walked several miles through the bush and along the treacherous roads to hear from God, and they would be disappointed if I didn’t speak for at least a couple of hours. You might know what I’m talking about—the “missionary call to Africa” we get when we decide to “give our all” to God. The altar calls demanded every ounce of strength I could muster to stand my ground, even though everything inside me wanted to be God’s little warrior. But I had to stand firm. I couldn’t risk full surrender, knowing it could mean the end of life as I knew it. I liked my life just the way it was. A sentence to some remote jungle of Africa, never to see my family or pony again, would ruin everything. It didn’t help that the song leader – and everyone for that matter – always seemed so somber, like someone had just died, or was about to die, as we sang songs like I Surrender All, and I’ll Go Where You Want Me To Go, Dear Lord! Now here I am, about to land in Africa. My pulse quickens as I rehearsed my mission: Deliver thousands of dollars worth of drugs and medications to an orphanage near Kobare, north of Lake Victoria and a little north of the equator, not too far from Uganda. In essence, I’m an international drug runner, and I don’t know a soul where I’m going. But I’ve never felt so alive in all my life!